Of all the sectors, press reports are indicating that the police department is on a silent go-slow as its workforce protests their latest salary increases. Teachers too are breathing fire over their delayed pay hikes that have been with us for decades. Not to be left behind, COTU is also threatening a five day nationwide strike if our honorable MPs force more taxes on poor Kenyans. Surely, if the police are protesting, what will stop other armed forces from following suit since hard times are affecting everybody? What guarantees do we have that if one day a fire breaks out in the Central Business District, the Fire Brigade will be on a go slow? Behind closed doors, doctors, nurses, academia and other sectors are closely watching the government’s every step in dealing with MPs. If the Executive succumbs to their pressure, it may be the beginning of the legendary Pandora’s Box. And the argument will simple and laudable. If there is cash to continue lavishing the already overpaid MPs, why not for our suffering teachers, nurses, doctors and agricultural extension officers? If there are any indications of things to come, this week’s street demos organized by the civil society in protest against MPs’ attempt to increase their salaries is a sure indication that the social fabric is under a lot of attack from many fronts. Now that our honorable members have refused to go on recess unless the Finance Minister succumbs to their demand; now that the coalition Chief Whip is publicly attacking his principals over the salary dispute, one can safely say that there is no government worth talking about. Since 220 MPs have chosen the path of confrontation with the masses of Kenya; and poor suffering Kenyans at that, one thing is sure to happen. If Uhuru Kenyatta bends backwards, the masses will rise up against this regime because they have reached their tipping point. And remember, the poor have nothing to lose except their poverty. They did just that after the 2007 elections. Now that MPs are insisting on remaining in Parliament unless their demands are met, it is time the masses also insist that the MPs must go home without salary increases until all those poorly paid public servants are compensated and cushioned against hard economic realities. 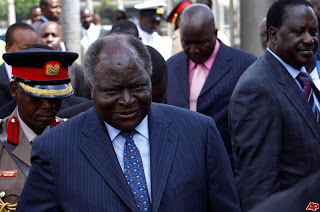 One option available to Kibaki is to dissolve Parliament now even before the Referendum and send the MPs packing. However, new elections must be held only after the August referendum irrespective of the outcome. And let no 220 individuals think they hold the future of the new constitution and this country in their hands because they don’t. 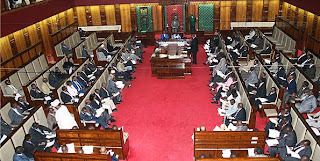 Kenyans will vote either way whether MPs campaign for the referendum or not. More importantly, if the President dissolves Parliament because of MPs greed, one thing for sure; none of them will return to the august house except for maybe three or four of them. Dissolving Parliament now and holding elections in December 2010 will achieve four things. One, it will save the country the salaries of these MPs for six months. Two, it will avert the planned nationwide strikes and civil unrest. Three, this administration will redeem its image in the eyes of the public. Four, Kenyans might just overwhelmingly vote for the new constitution. Yes, it is possible to dissolve this Parliament and let the executive run the government for the rest of the year. After all, cabinet ministers and permanent secretaries will remain in office legally until a new government comes to power sometimes in January or February 2011. It is the only way to deal with a bunch of ungrateful and selfish individuals such as we have in the 10th Parliament. One other reason why these MPs must be sent home now rather than later is because they have made Kenya a laughing stock all over the world. Their insensitivity to the suffering millions of Kenyans is unparalleled. Their inability to feel for Kenyans, to reason logically and to rationalize their demands has no parallels in this region. With each passing day, they have continued to behave more and more like “Tahidi High” school kids who must be forced to learn every moment of the day. It is the same reason the little respect they have enjoyed with Kenyans has gone through the window. Television footages depicting MPs under siege from civil society demonstrators calling them thieves in front of TV cameras would move the most hard hearted of a public leader anywhere in the world to resign if not for anything else but to avoid more future public humiliation. Yet, all our honorable members could afford to do was to retreat into the chambers of the august house and dig in on their pay demands. With this kind of behavior, we must admit we have come to the end of the road with our Tenth Parliament. Sending it home is the only option.